American Eagle Bar and Coin. 3 oz Silver Bar and Coin. PRSALE - SHIPS END OF JANUARY! This premium commemorative set recognizes the 50th anniversary of the Apollo 11 mission and the first manned landing on the Moon. 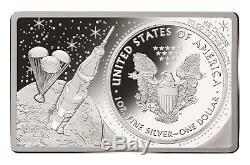 This coin and bar set includes a 2 oz. Proof Silver bar holding the official 1 oz. 2019 American Silver Eagle coin. 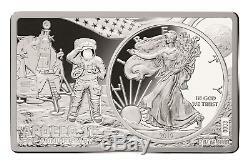 The obverse features the Walking Liberty with the Apollo 11 Lunar Lander and saluting astronaut on the Moon. The reverse reveals the Heraldic Eagle depicted with the Saturn V rocket at takeoff to the Moon and Lunar Module at splashdown upon return from the Moon. President Kennedy's famous quote "We Choose to go to the Moon" is echoed on the bar. Both pieces are struck in. 999 pure silver and are highly limited to 1969 pieces worldwide. 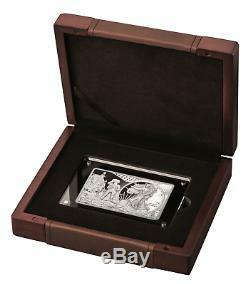 Each set is individually numbered on the bar and includes a collector display box and COA. Bar numbers will vary, picture is just for demo purposes. 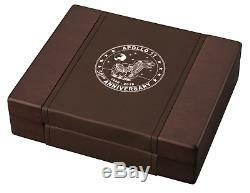 The item "2019 3 oz 50th Anniversary APOLLO 11 American Eagle Silver Coin Bar Set Box COA" is in sale since Saturday, January 19, 2019. This item is in the category "Coins & Paper Money\Coins\ World\Commemorative". The seller is "ibexcoins" and is located in Springfield, Virginia. This item can be shipped to United States, all countries in Europe, all countries in continental Asia, Canada, Australia.